It may seem strange that most Everest teams do some additional training at Base camp before starting their paper climb. Early this week, the course is filled! But first, the news. The Nepal Tourism Ministry has updated their permit numbers for Everest South Side 2019. 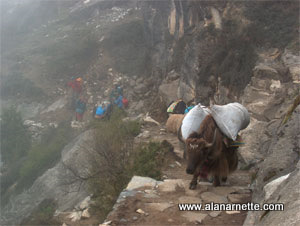 IMG said eight of their Sherpas have gone to Camp 2 to set up the cooking and dinning tent. This marks the first big progress above EBC this year. So how much is enough? Remember that 1 GB is 1,000 MB. While most people simply want access to email, text or WhatsApp, and for they would be fine at 1 GB. Others might want to FaceTime or Skype, they will need to bump up to probably 5 GB if they connect every few days. Then for those who want to stream movies or videos from YouTube, break out the hundred bills and buy the 10 GB card. Also, I’m hearing that the speed at EBC is painfully slow. I have a question into EverestLink to see if they are aware of the situation and what their plans are for a fix. Rolfe Oostra of 360 Expeditions has an excellent overview of their journey from Lhasa to Chinese Base Camp aka CBC. I’ve been asked why I don’t cover the journey to CBC like I did for EBC, well its simply not as exciting .. and, you are in a vehicle most of the time, so I’m not sure what to report. Visit his page for more excellent pictures and a vivid write up. While most people coming to Everest know how to climb in their crampons, scale a near vertical snow wall and rappel, they probably have little experience crossing a ladder wearing crampons. So the next team leaders will put their charges through a bit of an obstacle course. This serves two purposes: 1) review basic skills and brush up on techniques and 2) get the mind focused on what’s ahead. This morning we set up a fixed ropes course in the ice pinnacles near camp, to practice ascending, rappelling and ladder crossing. These are skills we will be using soon when we climb the Khumbu Icefall, and it’s not the place to try and remember how to connect your ascender or rig a rappell. All the climbers got stuck in and refreshed their ropework skills, tried out new pieces of equipment, and also did the same skills wearing big gloves and mittens. Thus far, #Everest 2019 is going well, right on schedule on both sides. The actual climbing will pick up this week, especially towards the weekend assuming the weather continues to be good. Thank you for doing what you do. Enjoy the blog.